Yankee Candles are some of the most popular candles on the market, along with Diptyque (a bloggers' fave). They come in a variety of sizes: I have the smaller tea lights as well as these two large jars. 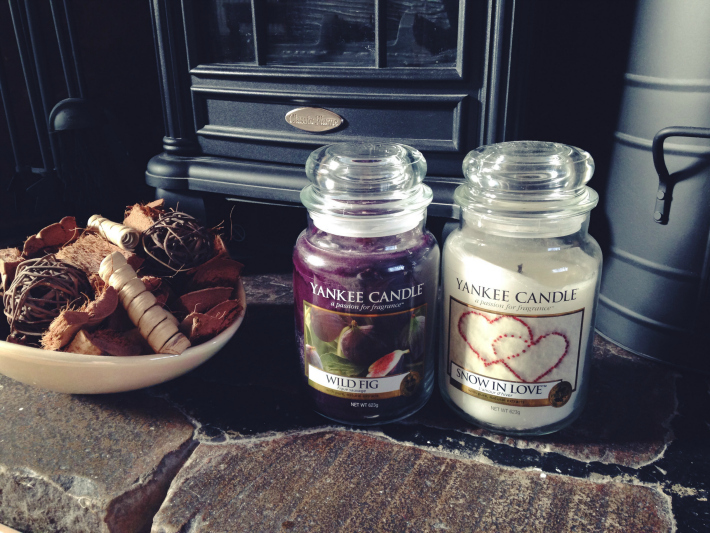 The candles are both Wintery scents, especially Snow in Love. I'm not too sure but I think it might have been limited edition for the Christmas period. It's a soft, subtle fragrance that smells fresh and clean. It's definitely not the strongest scent but it's lovely to burn in the mornings or when enjoying a bubble bath. There are other fresh scents that I've been eyeing up too, including Fluffy Towels (it's amazing how much this actually smells like fresh, fluffy towels) and Clean Cotton (it smells exactly like clothes just taken out of the washing machine). I'm smelling these whenever I pop into card shops and they're on my wish list for Summer. The other scent is Wild Fig. Words cannot describe my love for this scent: its rich and fruity and has the perfect mix of warmth with a gorgeous sophisticated aroma. I first smelt this at my boyfriend's house and I picked it up the next day because I loved it that much. Wild Fig is a stronger scent than Snow in Love, and it's one you can smell throughout the house. My mum likes to burn it after we've all had dinner to rid the smell of food. Wild Fig is my favourite too! I was eyeing up and then my housemate bought a large jar, so I love burning it on a Friday night! Fig is such an underrated scent but I think it's wonderful.